1.1 Background of the problem. 1.6 Significance of the Research. 1.11 Scope and Limitation of the study. 2.1.1. Categories of Electrical and Electronic Equipment Covered By These Definitions. 2.1.2. List of Products Which Fall Under Each Category. 2.1.3 Types of E- Waste. 2.2.1 E-Waste Toxic Components and Their Effects. 2.2.2 Global Estimates of E-Waste. 2.3.2. Important Methods of E Waste Disposal. 3.2.2 Functions of the National Environment Policy, 1997. 3.3. Specific E-Waste Management Legislation. 3.3.9 Provisions Relating to Waste and E-Waste Management. 3.4.6 Provision Relating to Waste and E- Waste Management. 3.5.3 Provisions Relating to Waste and E-Waste Management. 3.7.2 Provisions Relating to Waste and E-Waste Management. 4.1 Challenges on the Management of E-waste in Tanzania. 4.2 The Need of Separate E-Waste Legislation. 4.3 Whether there is a legal lacuna with respect to the management of e-waste disposal in Tanzania. 4.4 Whether the statutory and regulatory framework with regards to the management of e-waste disposal in Tanzania is effective and sufficient. 4.5 Whether the establishment of specific e-waste policy and enactment of specific legislation on e-waste management would solve the problem on e-waste disposal in Tanzania. The undersigned certify that he has read and hereby recommend for acceptance by the Jordan University College a thesis entitled: E-Waste Disposal in Tanzania: Analysis of Statutory and Regulatory Framework , in fulfillment of the requirement for the degree of Bachelor of Laws of St. Augustine University of Tanzania - Jordan University College. It is not easy to mention all people who have stood by my side to the setting of this accomplishment; it is worth mentioning some inhere. First the almighty God, who I trust is the source of every good opportunity that befalls on me; through Him alone I am blessed with good health, strength and capabilities. My heartfelt acknowledgement to my dear wife, Upendo Zephania Ryoba, my daughters, Ruth and Lizzie Francis Mbago; your spiritual, moral and financial support has encouraged me to this accomplishment. I would also love to acknowledge Bishop and Senior Pastor of Canaan Christian Worship Center; Zephaniah Matiko, R. and Dr. Ruth Nnala, R. Your spiritual guidance has taken me so this far. My heartfelt gratitude and appreciation is also extended to the Department of Law at Jordan University College under the great leadership of Advocate Nahum A.B. (LLB), (LLM), for their great commitment, tolerance and efforts extorted in directing, assisting and encouraging me to carry out my studies for good four years and more so for the kind encouragement to participate in conducting this academic legal research with confidence and competence. My acknowledgement is also extended to my fellow students and personal friends; we have moved together with many challenges of being strangers to this field, from empty minds to the minds that is coached with letters of laws. Lastly, I would love to express my sincere gratitude to mysupervisor H.O.D Advocate Nahum A.B. (LLB), (LLM) for the continuous support of my study and research, for his patience, motivation, enthusiasm, and immense knowledge. His guidance helped me in all the time of research and report writing.I couldn’t have imagined having a better advisor and mentor for my research. Because of you Sir, this work is built in this shape. Much respect; may God increase you and bless you Sir. Local Government (District Authorities) Act No. 7 of 1982. The National Information and Communications Technologies (ICT) Policy (2003). Electronic waste (e-waste) is a term used loosely to refer to obsolete, broken, unusable or irreparable electronic devices like televisions, CPUs, computer monitors (flat screen and cathode ray tubes, laptops, printers, scanners, and associated wiring The definition of e-waste is extended to include other second hand e-products which are being exported from their countries of original to other developed countries. E-waste management is a global concern and it becomes a priority as the world experiences tremendous technological innovations, countries are being forced to develop and adopt new models for the collection and environmentally sound disposal of this waste. In Tanzania there is no specific legislation with regards to the management of e-waste disposal; its legal setting through EMA covers the issue of e-waste disposal in a general context. It clusters e-waste together with other solid waste. The Act doesn’t have any specific provisions on e-waste. The Act under Part IX considers e-waste in general context as hazardous waste thus making its regulation and management ineffective. This research tests the hypothesis on whether there is a legal lacuna with respect to statutory and regulatory framework dealing with e-waste disposal in Tanzania, whether statutory and regulatory framework in Tanzania, with regards to e-waste disposal is sufficient and effective in protecting, preventing and controlling e-waste disposal in Tanzania and whether the establishment of specific e-waste policy and enactment of specific legislation regarding e-waste disposal in Tanzania would amount to equitable solution over e-waste management. The main objective of the study is to identify legal lacuna that exist on the management e-waste disposal in Tanzania, to make an analysis of the statutory and regulatory framework with regards to e-waste disposal and to recommend establishment of effective legislation with regards to e-waste management in Tanzania. In realizing the objective; the research and made extensive analysis of legal framework on management of e-waste disposal; and various findings are discussed in connection with the interviews and questionnaire and in the final end the research recommends establishment of e-policy, regulatory authority and enactment of specific policy to cover for the management of e-waste disposal. The contribution of technology to the well-being of mankind cannot be disputed. But due to toxic and hazardous nature of the EEPs which poses a great harm to the environment, the call for the management of e-waste disposal is of a great vitality. The whole process of the technological innovations should be environmental friendly. This notion is justifiable even to the international convention on protection of environment as it was emphasized by many successive international conferences. Chapter 34 of Agenda 21 noted that “The environmentally sound technology are essential requirement for sustainable development and that “There is a need for favorable access to and transfer of environmentally sound technologies, in particular to developing countries…” As technological advances, a deliberate mechanism has to be adopted to allow sustainable protection, reduction and control of e-waste disposal. This is important in order to have safe environment for the people. The EMA provides for legal and institutional framework for sustainable environment management, it also ponders the principles of environment management, as well as industrial waste management generally but does not carry specific provision regarding the management of e- waste disposal. The Act considers e-waste in general context as hazardous waste thus making it ineffective in combating e-waste management in Tanzania. This chapter discusses the background of the problem where a short history of the development of waste management globally and in Tanzania is viewed. It also states the statement of the problem which is the heart of this research. It again provides for the general and specific objectives of the research and state the hypothesis of the study as well as the significant of the study. Moreover the chapter makes discussion on various literatures which have been used in this research, and show research methodology, data collection method, data analysis techniques and finally it states the scope and limitation of the study. "Electronic for consumers are being treated like disposable items more and more every day. One of the major factors causing this trend is that companies are endlessly marketing new technologies to us, which effectively render recent products as obsolete"
Departing from the above quote, it is undisputable fact that the acceleration of technological innovation is too high. Over the years we have experienced firsthand how fast the use of ICT and EEEs has been adopted globally. It's evident that the numbers of ICT and EEEs users have gradually being increasing both in the developed counties and the developing countries, and the trend affects urban cities as well as rural areas. The history of waste management can be traced back from the pre-modern times when the amount of waste generated was insignificant due to low population density, low technology and low societal level of the exploitation of natural resources. Common waste produced during that time was mainly ashes and human biodegradable waste, and these were released back into the ground locally, with minimum environmental impact. Due to the technological level of the time, e-waste was not a challenge and was not predicted to be the future challenge and as an area of concern in environment protection. In fact in some circumstances it was taken or considered to be important for ground fertilization. In Modern era, following the onset of industrialization and sustained urban growth of large population centers in England, the buildup of waste in the cities caused a rapid deterioration in levels of sanitation and general quality of urban life. The streets became choked with filth due to the lack of waste clearance regulations. The situation is going worse even to villages due to the effects of the levels of development. Calls for the establishment of a municipal authority with removal powers occurred as early as 1751, when Corbyn Morris in London proposed that, "...as the preservation of health of the people is of great importance, it is proposed that cleaning of the city, should be out under one uniform public management, and all the filth be... conveyed by the Thames to proper distance in the country". However it was not until the mid-19th century, spurred by increasingly devastating cholera outbreak and emergence of a public health debate the first legislation on the issue emerged. Highly influential in this new focus was the report The Sanitary Condition of the Labouring Population in 1842 of the social reformer, Edwin Chadwick, in which he urged for the importance of the adequate waste removal and management facilities to improve the health and wellbeing of the city's population. In the UK, the nuisance Removal and Disease Prevention Act of 1986 began what was to be a steady evolving process of the provision of regulated waste management in London. The Metropolitan Board of Works was the first citywide authority that centralized sanitation regulation for the rapidly expanding city and the Public Health Act, 1875 made it compulsory for every household to deposit their weekly waste in moveable receptacles: for disposal thus the first concept of dust -bin. The dramatic increases in waste for disposal led to the creation of the first incineration plants, or, as there were called, "destructors". In 1874 the first incinerator was built in Nottingham by Manlove, Allliot& Co. Ltd. to the design of Albert Fryer. Similar municipal systems of waste disposal sprung up at the turn of the 20th century in other large cities of Europe and North America. In 1895, New York City became the first U.S. city with public sector garbage management. Until this time no one was predicting e-waste to be of a major environmental problem in the world. In 1960’s we see global advocacy on environmental protection. The 1st Phase is traced in 1972 where there was global environment conference held at Stockholm Sweden “Stockholm Conference” UN Conference on Human and Environment. The main focus of this conference was based on what should be done with the environment destruction caused by the WWI. This conference came up with twenty six principles enshrined in Stockholm Declaration in which principal 22 calls upon states to cooperate in developing international law regarding liability and compensation for victims of pollution and other environmental damages caused by activities within and beyond their jurisdiction. The second phase is traced in 1987 where we have Bluntland Report, which was developed by the world commission commissioned with a task to persuade what was agreed on Stockholm declaration. This report defined the concept of sustainable development to mean the development which meets the present needs without affecting the ability of future generation to meet their own needs. Bluntland report emphasized that the policy development should be reformulated to reflect sustainable manner of development. The 3rd Phase is traced back to 1992 where there was UN Convention on Environment and Development. This was a response of Bluntland Report. The focus was the access of development which is sustainable. The global initiatives caused national and regional responses in environment preservation, reduction and control of pollution cause by human activities. In 1976, The Resource Conservation and Recovery Act (RCRA) was enacted in USA. The RCRA was the initial law that governs disposal of general hazardous waste from chemicals to electronics. While this original piece of legislation was designed to protect citizens, it led to widespread dumping of e-waste on foreign nations and US charitable organizations. What is interesting here is that, the regulation of hazardous waste in US opened a flood gate e-waste dumping to developing countries. In this regard Tanzania was one of the targeted damping places of e-waste generated in US and elsewhere in developing countries. The e-waste dumping in developing countries took the form of charity donations to boost economic development. That was a selfish attempt of the US Government to protect their own people at the expense of endangering health of subjects of developing countries. They did not put into consideration the fact that, environment protection demands collective global efforts to combat because there is tendency by the principle of global currencies that, there is movement of toxic elements on air,bearing in mind that the atmospheric condition of most developed countries like Tanzania is very hot. This hot climate saturates the toxic materials, especially those in liquid form into air as vapour. This brings the implication that; toxic element in the underdeveloped countries could be easy transferred as vapour to the developed countries and settle there because of cold weather as opposed of hot weather in most of developed countries. Between 1986-1988, there were two major environmental controversy incidents. In August, 1986, a cargo freighter loaded with 14000 tons of toxic and hazardous waste was adrift at sea, looking for a dump site. The waste originated in Philadelphia, who first attempted to dump it on neighbouring New Jersey. The Garden State ceased accepting outside waste in 1984, so the waste was loaded upon a freighter and sent abroad. Multiple nations refused to accept the waste, leaving the toxic cargo at sea. The waste was eventually dumped in the open ocean leading to the Basel convention, which prohibits nations from exporting their e-waste into other countries or the ocean. But basing on the economic setup of the developing countries especially in Tanzania the implementation of Basel convention is rendered almost impossible, as the economic structure of the developing countries still demand EEEs donations from developed countries and most of the time these donations are second hand EEEs which have short life span. Between 1990-2000, there was a remarkable development of e-waste management where we see several countries both developed and developing adopting effective and specific e-waste management schemes. In 1991 Switzerland began to regulate the specific disposal of e-waste within its borders. Switzerland is regarded as one the developed countries which has developed a comprehensive and effective mechanism on e-waste management. In the same trend African nations adopted the Bamako Convention, aiming at banning the import of disposed waste and prohibiting dumping by other nations. But due to the technological level and economic level of most African countries the implementation of Bamako Convention was and is not effective as African countries still receives undurable EEEs as charity donations from developed countries. Again economic level renders it impossible for many Africans to afford new EEEs thus used EEEs becomes an option. In 1992 The Basel Ban, which prohibits dumping waste on lesser developed nations, adopted by 175 countries, with the exclusion of the United States. Between 2000 – 2015, we have the following trends: In 2003, the Electronic Waste Recycling Act of 2003 (2003 Cal ALS 526) (EWRA) was enacted in California. It was the first US state to enact a law regarding the proper disposal of e-waste, other states began to follow this example. In 2007 Panasonic, Sharp and other manufacturers began to address the issue, forming the Electronic Manufacturers Recycling Management Company. In 2009 Electronic Device Recycling Research and Development Act was introduced, giving the EPA additional powers and the ability to provide grants to communities and organizations. In 2010 the US announced a program to combat e-waste, including a task force and “America Recycles Day” and campaign. In 2013 Colorado banned dumping of e-waste in any location other than approved recycling centres. Until 2015 about twenty five states in US had established laws governing e-waste and various non-profit, state and federal government entities continued to educate consumers and businesses on the dangers of e-waste. The growth stream of e-waste is so high and its immediate threat to environment. In 2005 an estimate of 5.3 Billion pound of electronic waste was generated (EPA, 2005) out of this only 9% was recycled (Yodong et al, 2006). In Tanzania the number of mobile phone subscribers rose by 25% in 2015 to 39.8 Million. It was reported that, "the number of Tanzanians suffering from cancer, respiratory illnesses and reproductive problems is likely to shoot up as a result of poor management of waste in electrical and electronic equipment (EEE) or e-waste,." Projections based on the results of an inventory undertaken by the CPCT, 2011 show that the amount of e-waste generated from computer alone was about 2300 tonnes annually, indicating that the amount of e-waste currently being generated in the country is in the range of 18000 to 33000 tonnes annually. Another report by CPTC, 2008, says that, it is estimated that between 30 and 40 percent in total market are counterfeit. According to CPTC, in 2010 a total of about 53 tonnes of counterfeit EEE were seized and disposed of. Viewing the circumstances closely, it is evident that e-waste is a fast growing type of waste in Tanzania endangering the environment thus making it inevitable for all stakeholders to direct their attention to the regulation and management of the same. Tanzania legal framework covers the area of waste management in its solid state like, plastic waste, nailon waste mostly in urban area rather than e-waste. The EMA provides for legal and institutional framework for sustainable environment, it also ponders the principles of environment management, industrial waste management generally but does not carry specific provision on e- waste. The Act considers e-waste in general context as hazardous waste, Section 3 thus making it ineffective in regulating and managing e-waste. The way the regulation is drafted does not impose legal obligation but rather a voluntary service by the actors, a service which have proved to be ineffective and inefficient over the years. In the upshot it is logical to conclude that the regulations are in adequate and in effective in covering for e-waste management generally thus the likelihood of their success are unpredictable for the simple reason that; e-waste is generalized with other types of waste viz hazardous waste, the regulation is placed without sensitization of different stakeholders and the regulation does not impose any legal obligation to the actors to the effect of disposal of e-waste. Technological innovations and stiff market competition of EEEPs has called the open floodgate of e-waste in the world and in Tanzania. These products contain toxic components which are threat to environment and harmful to human health. In Tanzanian environmental protection is regulated by EMA and its Regulations as well as other laws and national policies which establishes legal and institutional framework with regards to the protection of environment. These laws lack specific provisions covering for the management of e-waste disposal. For example EMA in Part VIII and Part IX covers the issue of e-waste in a general context as it clusters e-waste together with other solid wastes which have no toxic elements in their composition. Again the Act and its regulations does not impose any liability on the users but introduces a voluntary take back of electrical and electronic waste to the manufacturers or dealers for the purpose of inter alia re-using, recovering, recycling and for final disposal, the available regulations does not provide any legal obligations to the producers, collection centers, bulk consumers, recyclers and dismantlers thus rendering e-waste management ineffective. Moreover there is no a separate policy covering the aspect of e-waste and its management. NEP recognizes that, science and technology gave a central role in the exploitation, processing and utilization of natural resources, and in resulting environmental impacts, but it does not carry specific statements with regards to e-waste and its management. Basically there are four options when one retires from using EEEs. (Computers, TVs set, and Mobiles phones): to recycle them, to donate them, to return them to the manufacturers or dispose them in trash. The last option is pre dominant in our society. 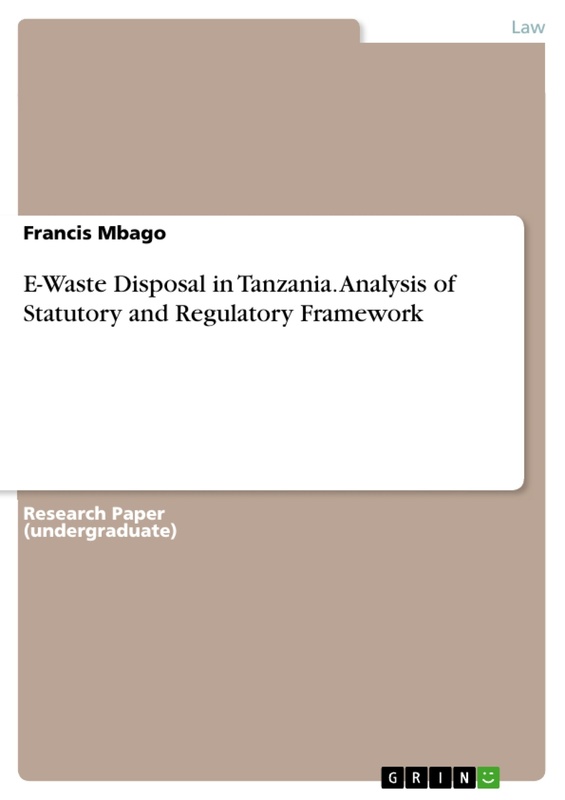 The overall objective of the research was to make an analysis of the statutory and regulatory framework with regards to the management of e-waste disposal in Tanzania. - To identify the legal lacuna that exists in Tanzanian laws with regards to the management of e-waste disposal. - To make analysis of Statutory and Regulatory Framework on the management of e-waste disposal in Tanzania. - To recommend the best solutions with respect to the management of electronic waste disposal in Tanzania. It appears that, there is a legal lacuna with respect to the management of e-waste disposal in Tanzania. It appears that statutory and regulatory framework on the management of e-waste disposal in Tanzania is ineffective. It appears that establishment of specific e-waste policy and enactment of specific legislation on e-waste management would solve the problem on e-waste disposal in Tanzania. i) It will make a valuable contribution in legal academic circle on the subject of environment. ii) It will bring awareness to the proper personalities and authorities ranging from state officials, policy makers, legislators, environmentalists, and other stake holder in understanding the depth of the anticipated danger accrues as a result of accumulation of E-waste. iii) It will bring awareness on the global trend of e-waste stream and suggested means of its management. iv) It will bring comprehensive data on electronic waste in Tanzania. v) It will bring a contribution on the Tanzania legal system as it will recommend the establishment of specific policy on e-waste management or amendment of EMA and national environment policy to incorporate specific provisions of e-waste management or an enactment of specific policy and laws to that effect. vi) The study will promote the use of environmentally sound technologies, that is, technologies that are friendly to environment and less polluting. vii) It will analyze statutory and regulatory framework of laws relating to e-waste disposal in Tanzania. VicentMtavangu (2017): The author in his article submitted that e-waste stream in Tanzania and elsewhere in the world poses an area of concern, as the amount of e-waste generated is increasingly wide and the e-waste so generated are composed of toxic materials which are harmful to the environment thus immediate action should be adopted by the authorized personalities to establish proper legal mechanism for the management of e-waste disposal in Tanzania. The author further pointed out some challenges on the management of e-waste in Tanzania; the main challenges being, lack of e-waste policy, e-waste regulatory framework is inadequate as it carries no specific provisions on the management of e-waste, the responsibilities of actors under the regulations are not well articulated and what amounts to e-waste is not well defined, awareness of the e-waste related issues is also a big challenge and there are no regulations in the country regarding the importation of used electrical and electronic devices. Although the author’s arguments in his article are in support of the effects of e-waste in the environment, the author did not cover the categories of EEEs, and just listed a few components of EEEs, and did not say what specific effects and problem these materials cause to the environment, neither did he discuss in details on the methods of e-waste disposal. This research discusses the categories and toxic components associated with e-waste and also discuss specific effects and problems e-waste causes to environment basing on the inference that, the knowledge of e-waste in its deep aspects facilitates the knowhow of its management and while appreciating recommended solutions propounded by the authorthis report introduces new additionto the solution by recommending the establishment of specific regulatory authority to regulate specifically for matters regarding e-waste management in Tanzania. Hieronymi, K et al (editors) (2013): This book is considered in this research as the writers covered the aspect of e-waste management in relation to environmental, economic and social issues associated with international reuse and recycling of e-waste pointing that population and globalization is driving the demand for products, resulting in rising prices for many materials. Used and electronic products and recyclable materials are increasingly crisscrossing the globe thus creating both challenges and opportunities for e-waste management. This focuses on the current and future trends, technologies and regulations for reusable and recyclable e-waste worldwide. It compares international e-waste management perspectives and regulations under a view that includes the environmental, social and economic aspects of the different linked system. It overviews the current macro-economic trends from material demand to international policy to waste scavenging, examines particular materials and products streams in details and explores the future for e-waste and its management considering technology progress, improving end-of-lifecycle designs, policy and sustainability perspectives. The analysis aimed at educating the consultants, legislators, recyclers on waste future development of product streams and the necessary adoption of waste management and legislation regulating it. The scope of this research carries the same purpose, the difference is; the writers were focusing in globe (worldwide trend) while the research settles its focus specifically on the management of e-waste disposal in Tanzania. G. Din and E. Cohen (2013): This article presented the key elements for best performance and profitability of Municipal Solid Waste (MSW) management in low-income city. Their research provides an overview of methods and models for integrated planning of a two phase program; MSW collection, transpiration and treatment. The writers concentrated mostly on solid waste management presenting the case of Matadi (the Democratic Republic of Congo) that has low level of the MSW management compared to other African cities. The writers focused on MSW but the method presented may be adopted as Municipal Electronic Waste (MEW) in Tanzania in solving e-waste problem and that amounts to the reason of using this material in my proposal. The research has more of economic effects, this research intends to look on the other side of the coin and consider the discussion on legal effects of MEW. It is used as, the bases of proving that e-waste is a problem to deal with and advocating for statutory and regulatory framework which is the core intention of this research is of a great vitality. Daniel Kolosen and Faith Shimba (2012): The writers submit that, Government and non-Government institutions are heavily investing in ICT to enhance their businesses and operational activities. Subsequently, there is a rapid increase of ISPs, MSPs and ICT asset vendors country-wide. This implies a massive increase in imported ICT assets as well of number of ICT assets that are going out of the ICT assets life cycle. They submit further that the challenges facing Tanzania in disposing end of use ICT assets includes; lack of ICT disposal policies and procedures, lack of ICT management plan, storage challenges, lack of trained personnel and disposing infrastructures, challenges in legal aspects, recycling capacity, privacy , confidentiality and information security concerns. The author made some discussion ranging from definitions and aspect of challenges that are available with regards to ICT assets disposal and went further suggesting the remedies available. This work is relevant as it covers the same area which is covered by this research. The authors of this work talked of the ICT assets. The research settles in e-waste context mainly looking e-waste disposal in Tanzania. Okomu J, O (2011): The writer covered the aspect of solid waste in African cities and in page 13 of his work the writer talks about e-wastes in East Africa urban centers. Pointing that although e-waste forms a significant component of disposed waste as regards to risks to the environment and urban community, urban councils have no comprehensive data on electronic waste. The author lays down that, there is no formal e-waste management in Uganda, Kenya and even in Tanzania. The author covered West Africa and East African counties. This research reduces the discussion to the management of e-waste disposal in Tanzania. Basing on what has been presented by the author this research aims at, making a contribution specifically for comprehensive data on e-waste and its disposal in Tanzania and recommending the enactment of specific legislation to provide for the management of e-waste disposal or amendment of EMA and NEP to incorporate specific and comprehensive provisions on e-waste management. Research Unit (LARRDIS) RajyaSabha Secretariat New Delhi (2011): This research has contributed a lot on the issue of e-waste. Several aspects have been covered including the meaning of e-waste and its composition. The selection of this material in this research is triggered mostly by its discussion of the composition of e-waste which carries toxic materials, which are harmful to environment. It also covered the concept of e-waste in global context, which means it will bring awareness of the global trend on e-waste generation. The research has also covered the issues of management of e-waste, discussion on e-waste legislation and regulatory regime of e-waste which is of a great relevance to the makeup of this research. It also covered the aspect of international experience on e-waste. It mainly discussed on The Basel Convention, The Bamako Convention and Rotterdam Convention of which this research also touches in making the analysis of statutory and regulatory framework. The scope of the material is the globe; the present research reduces it to the discussion of e-waste management in Tanzania. Magashi, A and Schlurp, M (2011): The writers of the research provides for e-waste assessment in Tanzania. In which they discovered and proved that, the magnitude and the flow of E-waste generation is not well known in Tanzania and revealed that only few studies exists which contains a rough estimate of the installed based computers and e-waste generated (Kaunde 2009, VPO 2005) and analyzed the stakeholder set up in Dar-es-salaam (Mataheroe 2009). The writers submits further that, there is inadequate information on the existing practices and strategies on e-waste management in the country and they also present findings on e-waste assessment study conducted by cleaner Production Center of Tanzania in collaboration with EMPA of Switzerland within the framework of “UNIDO e-waste initiative for Tanzania” The research carries a reliable overview of e-waste landscape in Tanzania; it also proves that Tanzania has no specific policy and legislation on e-waste. The authors have presented the general contextual information on the effects of e-waste; this research ponders the specific aspects of the problems and effects associated with e-waste disposal in Tanzania. Gary C. Stevens and Martin Goosey (2009): The authors discussed on the issues of e-waste management covering the aspect of materials that are used in manufacturing of electrical and electronic products (EEPs). Materials like Lead, Calcium, Mercury, Haxavalent and Chromium; these materials are harmful to both human and environment. They again covered the issues relating to dumping, burning and landfill and touched also on the role of collective versus Industrial Producer Responsibility. The writers also covered on impact of legislation on materials used in electronics. From their perspective this research intends the discussion to the impact of legislation on materials used in electronics specifically in Tanzania. As such, the nature of their study material is relevant to this study as they relate with what the researcher wishes to cover all through this research, the difference is largely based on the fact that this research is strictly settled in the discussion of e-waste management in Tanzania. Linda Luther (2010): The writer is an analyst in Environment policy Congressional Research Services 7-5700. He wrote on managing electronic waste centering on issues relating to exporting e-waste. This research is not based only on exporting e-waste; it covers the subject to include the imported and those which are internally generated focusing on the management of e-waste disposal in Tanzania. E-Waste briefing book : This book is mainly cantered in the discussion of e-waste problem in global perspective. It mainly discussed the problem of e-waste in relation to the toxic materials used in the production of electronic products such as computers, mobile phones. In the discussion the book covered on growing sales of electronic products and the shrinking life span of the same, technological advancement which facilitated the shift from analog into digital. The author talked on the fact that most of the toxic electronic materials end up trashed in our landfills. He also talked of dumping our e-waste in developing countries in this he spotted that most of recyclers don’t recycle e-waste but they export it to Developing countries. The author also talked of two policy solutions to the e-waste crisis which are; Producer Responsibility for recycling and Ban Global e-waste dumping. The author also covered on various states which have passed legislation mandating that manufacturers to offer free e-waste collection and recycling programs as a condition of selling in their states. In view of what is discussed in this book, this research shows those aspects in connection with the situation of e-waste disposal in Tanzania. In the aspect of managing and controlling e-waste disposal the study proposes such legislation that will impose duty to the manufactures to initiate free programs on e-waste disposal and impose legal duty to the user to return their old product when they have reached to the end of using them. M. Khurmm. S. Bhuta et al: Authors in their paper showed the increased trend of electrical and electronics equipment in the global market for the past two decades. The writers found that, the increase of EEE poses new challenges to the environment with regards to toxic materials used in the production of EEEs thus the requirement of proper e-waste management of WEEE. The writers also predicted that the number of EEEs will continue to increase on global scale and microprocessors will be used in ever- increasing numbers in daily objects. As market is flooded with WEEE most people are unaware of the potential negative impact of the rapidly increased use of computers, monitors, televisions and other EEE. When these products are placed in the landfill or incinerated they pose health risks due to the hazardous materials they contain. The improper disposal of EPs leads to the possibility of damaging environment. In this paper authors have also discussed about the global significance of e-waste and current challenges for e-waste elimination basing on the capabilities of the developing countries in the management and control of e-waste. The writers also talked about regulations and market mechanisms and current approaches in e-waste management and e-waste management in industries. Basically the authors have discussed the matter on e-waste and its challenges and disposal in global perspective. This research reduces the discussion to focus on the same aspects with modified logical flow to reflect specifically Tanzania conditions mainly centering on the management of e-waste disposal. Krishna, R and Sampasaha, Ms: This is the study paper in which the authors attempted to make assessment of present situation of e-waste management globally as well as in India considering the present regulations and guidelines. The authors also pointed out that major part of recycling of e-waste is being handled by people in the informal sector who have little or no knowledge about the consequences of exposure to hazardous substances thus endangering their lives. The authors propose the concept of EPR with regards to e-waste management in sustainable method. In line with what the authors have discussed it is logical to conclude that even in Tanzania the situation is the same. In this study the researcher links the global situation of e-waste with the present situation in Tanzania and advocates for the establishment of specific policy and specific laws and regulations on the management of e-waste disposal in Tanzania. E-waste Policy (Nigeria): The policy has covered all important aspects on e-waste management in Nigeria. It has developed Institutional and Legal Framework on management of e-waste. This study used the policy to persuade policy makers, legislators of Tanzania to adopt some of the mechanism and establish its own Legal and regulation framework to manage e-waste disposal in Tanzania. The E-waste (Management and Handling) Rules: These are Rules enacted in 2011 and came into force in 1st May 2012 in India. These rules established and imposed legal responsibilities to various stakeholders ranging from producers, collection centers, bulk consumers, recyclers and dismantlers. Also they provided for procedures for seeking authorization and registration for handling e-wastes. Using the rules the researcher shows the relevance of establishing sound statutory and regulatory framework for the management and control e-waste disposal in Tanzania. The researcher used primary and secondary sources data collection. The primary source involved; interview, and questionnaire, whereas the secondary sources covered both binding and nonbinding sources. In the aspect of Binding sources the following were used; The Constitution of the United Republic of Tanzania, EMA, Environment management regulations and various laws relating to environmental protection. The primary sources form a vital part in data collection. This was crucial method as it helped the writer to have access on firsthand data in the process of retrieving reliable sources with respect to the actual situation with regards to e-waste management in Tanzania. This technique was applied in this research in order to conduct purposeful interaction with different experts and non-experts aiming at obtaining information regarding e-waste in Tanzania. Personnel's from, NEMC, MORUWASA, and TCRA have been involved. The interview also involved advocates, lawyers, businessmen and other people in Tanzania about their opinions and how they think on the extent of the problem. The research used this technique because it was an easy and effective method of getting information from respondents. The aim was to accumulate large amount of data since questionnaire was prepared and distributed to several reliable excerpts on the subject. The questionnaires contained structured questions, unstructured, and open ended questions which gave the respondent complete freedom of giving their views and providing information related to the research problem. This research used both binding and nonbinding materials. iv. The Environmental (Solid Waste Management) Regulations, 2009. This researcher applied thematic analysis, interpretive analysis and analytical method in data collection techniques. Thematic analysis was used because various topics or themes related to the e-waste problem in Tanzania were generated and examined. Interpretive analysis was used because the most interpretive elements of the study was identified and described to give meaning of the study and credibility of the data collected. 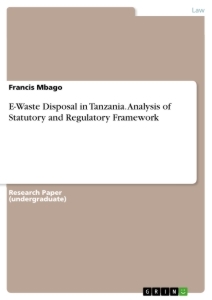 Analytical method was applied because the research makes an analysis of statutory and regulatory framework in order to reveal the legal gap that exists with regards to the management of e-waste disposal in Tanzania. Quick impression summary this technique was used because in the course of writing the researcher had to summarize the key findings on problems related e-waste disposal in Tanzania. This research covered strictly on the issues of e-waste isolated from other solid and liquid waste. Most of the data was collected from libraries, questionnaire and other internet sources. This chapter centered itself in bringing an understanding of the conceptual meaning of e-waste. Definitions from various sources have been provided. Again the chapter has discussed various categories of EEE covered within the range of e-waste and provided a list of products which falls under each category. The chapter also covered on the types of e-waste, composition of e-waste and toxic components of e-waste and their effects and it gave a detailed description of global estimate of e-waste and current status of e-waste in Tanzania. Furthermore this chapter outlined an over view of Human and Environmental effects of e-waste. In a nutshell the concept of e-waste disposal has been covered. Generally speaking e-waste is the term used to cover all types of electronically and electric equipment that has or could enter the waste stream. Although electronic waste is a general term, it has assumed technical usage as a term covering any household or business item with circuitry or electrical components with power or battery supply. These may consist of electrical and electronic equipment and accessories that are non-operational or whose life cycles are extinguished. Obsolete electrical and electronic equipment including computers, televisions, audio-visual recorders, mobile phones, printers and other electronic goods such as air conditioners, electronic toys, washing machines, sewing machines, lawn mowers, elevators, kitchen equipment, therapeutic equipment, surveillance equipment, mobile radio transmitters, refrigerators, and their accessories. 1. Large household appliances  : Includes, large cooling appliances; Refrigerators; Freezers; Other large appliances used for refrigeration, conservation and storage of food; Washing machines; clothes dryers; Dish washing machines; Cooking; Electric hot plates; Microwaves; Other large appliances used for cooking and other processing food;; Electrical heating appliances; Electric radiators; and other fanning, exhaust ventilation and conditioning equipments. 2. Small household appliances  : They include, Vacuum cleaners; Carpet sweepers; Other appliances for cleaning; Appliances used for sewing, knitting, weaving and other processing for textiles' Iron and other appliances for ironing; mangling and other care of clothing; Toasters' Fryers; Grinders, coffee machines and equipment for opening or sealing containers or packages; Electric knives; Appliances for air cutting, hair drying, tooth brushing, shaving, massage and other body care appliances; and clocks, watches and equipment for the purpose of measuring indicating or registering time scales. 3. IT and telecommunications equipments : Centralized data processing; Mainframes; Minicomputers; Printer units; Personal computers; (CPU, mouse, screen and keyboard includes); Laptop computer (CPU, mouse, screen and keyboard included); Notebook computers; Notepad computers; Printers; Copying equipment; Electrical and electronic typewriter; Pocket and desk calculators; And other products and equipment for collection, storage, processing, presentation or communication of information by electronic means; User terminals and systems; Facsimile; Telex; Telephone; Pay telephones; Cordless telephones; Cellular telephones; Answering systems; and other products or equipment of transmitting sound, images or other information by telecommunications. 4. Consumer equipment; Radio sets  : Television sets; Video camera; Video recorders; Hi-fi recorders; Audio amplifiers; Musical instrument; and other products or equipment for the purpose of recording or reproducing sound or image, including signals or other technologies for distribution of sound and image than by telecommunications. 5. Lighting equipment  : Luminaries for fluorescence lamps with exception of luminaries in household; Straight fluorescence lamps; Compact fluorescence lamps; High intensity discharge lamps; including pressure sodium lamps and metal lamps; Low pressure sodium lamps; and other lighting or equipment for the purpose of spreading or controlling; light with exception of filament bulbs. 6. Electrical and electronic tools (with exception large-scale stationary industrial tools)  : Drills; Saws; Sewing machines; Equipment for turning, milling, sanding, grinding, sawing, cutting, shearing, drilling, making, holes, punching, folding, bending, or similar processing of wood, metal and other materials; Tools for riveting, nailing or screwing or removing rivets, nails, screws; or similar uses; Tools for welding, soldering, or similar use; Equipment of liquid or gaseous substances by other means; tools for mowing or other gardening activities. 7. Toys, leisure and sports equipments  : Electrical trains or car racing sets; Hand-held video game consoles; Video games; Computer for biking, diving, running, rowing, etc. ; Sports equipment with electric or electronic components; and coin slot machines. EEE is defined as equipment which is dependent on electric current or electromagnetic fields in order to work properly. It is also equipment for generation, transfer and measurement of such currents and fields and designed for use with a voltage rating not exceeding 1000 volts for alternating current and 1500 volts for direct current. Electronic appliances are composed of different materials that can be both toxic but also of high value. These toxic materials are harmful to humans and our environment. Over 1000materials, including chlorinated solvents, brominates flame retardants, PVC, heavy metals, plastics and gases, are used to make electronic products and their components- semiconductor chips, circuit boards, and disk drives. CRT monitors and Tvs contain between four to eight pounds of lead. LCDs Tv contain mercury. Milligrams of mercury are used in each LCD, but it is so toxic that as little as one gram of airborne mercury deposited per year to a 20 acre lake is enough to maintain mercury contamination at the level where fish are unsafe to eat. About 40% of heavy metals, including lead, mercury and cadmium, found in landfills come from electronic equipment discards. Lead: Lead exposure causes brain damage in children and has already been banned from many consumer products. Mercury: Mercury is toxic in very low doses, and causes brain and kidney damage. It can be passed on through breast milk. In a 2000 report, the National Academy of Sciences estimated that over 60,000 babies are born each year at risk for neurodevelopment (nervous system) defects associated with high exposure of methyl mercury in the womb Once in water, bacteria transform the mercury into its more toxic form, methyl mercury. In this form, it is absorbed by aquatic plants and animals. Fish can absorb methyl mercury from water through their gills and by eating other fish that possess concentrations of methyl mercury. Consequently, the concentrations of methyl mercury in exposed fish's tissues increases over time, with fish high on the food chain possessing higher concentrations of methyl mercury than fish low on the food chain.. Humans expose themselves to methyl mercury when they eat contaminated fish. When pregnant women eat contaminated fish, their embryos or fetuses also are exposed to the methyl mercury, and they can develop congenital Minimata disease. Hebert, Lewis (2007). "Centenary History of Waste and Waste Managers in London and South East England".Chartered Institution of Wastes Management. Chadwick, Edwin (1842). Report from the Poor Law Commissioners on an inquiry into the Sanitary Conditions of the Labouring Population of Great Britain, London. pp 369-372. via Laura Del Col (11 October 2002). "Chadwik's Report on Sanitary Conditions".The Victorian Web. National Waste & Recycling Association. Washington, D.C. Accessed on 17/11/2017. Report of the United Nations Conference on the Human Environment, Stockholm, 5 – 16 June 1972: States shall cooperate to develop further the inter-national law regarding liability and compensation for the victims of pollution and other environmental damage caused by activities within the jurisdiction or control of such states to areas beyond their jurisdiction. Environment Management Act (Cap 20 of 2004) describes hazardous waste as “any solid, liquid, gaseous or sludge waste which by reason of its chemical reactivity, environment or human hazardousness, its infectiousness, toxicity, explosiveness and corrosiveness is harmful to human health, life or environment. Krishna, R -Sampasaha, Ms, Study Paper on e-waste management, Accessed from www.tec.gov.in>pdf>Studypaper. Sustainable Electronic Wastes Project (StEP), 'What is e-Waste? ', available at http://www.step-initiative.org/initiative/what is e-waste.php.